IMTrack combines all the tools necessary to run and maintain an efficient working environment on and off the playing surface. It produces the schedules and reports needed for internal office use and it brings you the world of the social internet instantly. 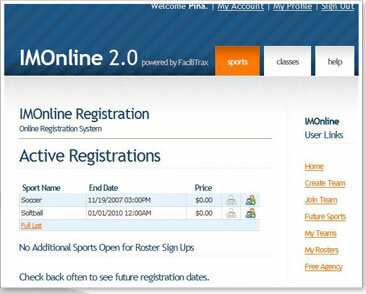 IMTrack allows for multiple types of registrations designed to give league managers flexibility to handle multiple types of tournaments. For leagues running instant scheduling, teams can sign up directly into the “divisions” that play at the day and time they desire to play. If the “division” fills up, they can choose an alternate time or request to be on the wait list. Teams can also register to play in specific “leagues,” allowing the managers to either run tournaments with those teams or to assign the teams to “divisions” after registration and create custom schedules based on the teams signed up. IMTrack’s scheduling tools provide league managers the flexibility to instantly create schedules or to schedule games individually game by game. Our instant schedule tool allows patterned leagues to be scheduled in a few games, whether the teams play all games at the same time or on the same field. Managers can schedule divisions for any number of teams, scheduling single or double round robins, or for a fixed number of games. One of the goals for IMTrack is to help reduce and prevent league games from being “forfeited.” Eligibility of students is checked both on sign ups and also when printing out the game sheets for that day. Multiple participation limits are in place to prevent players from signing up for more teams than allowed for by league rules. Additionally, roster minimums are in place to prevent teams from submitting online payments unless they have a specified number of players signed up to play. IMTrack’s bracket system allows to run multiple tournaments for each sport. With IMTrack you can crown multiple “league” champions, each having a unique tournament. Alternatively, you can group your divisions into “sub-leagues,” with each “sub-league” having a tournament before running a final “league” tournament to crown a champion. This system is very similar to NCAA championships where each conference (sub-league) crowns a champion before the NCAA runs it’s championship tournament. IMTrack provides a complete set of management tools to provide productivity benefits to the management office. Mangers can enter scores for every game, automatically maintaining league standings. Score entry allows for tracking of forfeits, cancelled games, and other special results. Managers can also track who played in each game as well as statistics for each game. Before you know it you can easily tell who leads your softball league in OPS! IMTrack enhances your web presence by automatically posting and updating information to the website. League standings, tournament brackets, schedules, top ten lists, games of the day, player and team statistics, league leaders and box scores are available to the public at all times. Your participants can login to gain access to their team portals, which gives access to their team schedule, current standings, team roster with contact information and statistics, and a private team message board.